On September 20th, 2017, everything changed for Puerto Rico. A hurricane of unprecedented strength destroyed much of the island, leaving a great majority of Puerto Ricans without power, access to food, water and communications. And generous people like you stepped up to help. I’d like to give you a quick update on Puerto Rico, the Hispanic Federation’s UNIDOS Program and how your dollars are at work. Three weeks after Hurricane Maria, most of Puerto Rico still does not have power. Lives have been upended, people are grasping for the most basic needs, and homes and livelihoods have been destroyed. The islands health care system is facing a major crisis made worse by fuel shortages and low supplies of medicine. Regular access to clean water remains out of reach for most. In short, the situation remains dire. The Hispanic Federation has convened government officials and community leaders in on the mainland U.S. and Puerto Rico to create the UNIDOS Disaster Relief and Recovery Program. The objective of the UNIDOS Program is to help the immediate and long-term recovery needs of children, families and communities in distress from the devastation caused by Hurricane Maria. 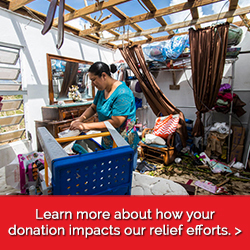 One hundred percent of contributions to the UNIDOS Program goes to help the immediate and long-term recovery needs of the people of Puerto Rico. Two days after the storm hit, we chartered a plane and worked with the Office of New York City Mayor Bill de Blasio to send 22 first responders to help with immediate relief efforts in Puerto Rico. The team included emergency managers to coordinate logistics and help manage recovery operations, members of the New York City Police Department, and staffers from the Department of Buildings with experience in building inspections and checking structural integrity. We have invested one million dollars to purchase food, water and other basic essentials for our people on the island. More than 750,000 pounds of emergency supplies have been delivered to distribution centers in San Juan, Toa Baja, Toa Alta, Dorado, Vega Alta, Corozal, Ponce, Guayama, Arroyo, Salinas, Adjuntas, Humacao and Peñuelas. Additional routes and distribution points are currently in development. We have worked with our community, government and private sector partners to coordinate nine relief aid flights – transporting tens of thousands of additional pounds of essential goods to Puerto Rico. Working with our staff, and a team of suppliers, local officials, and community leaders on the island, we have been able to make sure that our aid gets to some of the hardest hit locations in Puerto Rico. Partnerships with key officials and institutions on the island and in the U.S. mainland have also allowed us to elevate and more efficiently address ongoing needs. Beyond the extensive and ongoing relief we’re providing now, we have also seeded an initial $2.5M Fund to support grassroots nonprofits on the island with the goal of strengthening the support and social services infrastructure available to our families and communities in Puerto Rico. This is only possible because of your generous support. We’re proud of the work we’ve done to date, but we know our work is far from over. The rebuilding of Puerto Rico will take years and the Hispanic Federation is fully committed to seeing it through. We look forward to working with our partners in Puerto Rico and the U.S. mainland, with government, our growing network of nonprofits, and all of you to help our people in Puerto Rico get the help they so desperately need to recover.